I‘m the king of leftovers. Really. I come from frugal Irish farmer peasant stock, a long line of folks who would sooner lop of a limb as waste an edible morsel. If they planted it and tended it and picked it, they ate it, or they canned it or pickled it or preserved it, or they fed it to an animal which they they killed and ate or dried-pickled-canned-preserved. Now, I know some people aren’t leftover types. Frankly, I feel sorry for them. Some of my favorite comfort foods come from leftovers. I love meatloaf sandwiches almost more than I like meatloaf, and I always make plenty just so I’ll have days of meatloaf sammys. I don’t have to slaughter pigs nor do I grow my own food. But I do have a policy whereby if I buy it, bring it home, chop it, and cook it, then by golly, I’m gonna eat it. Over the years, I’ve developed loads of recipes to take advantage of leftovers beyond just heating them up in the microwave. But my absolute favorite, hands down, is the Leftover Frittata. Maybe because Brunch is my favorite meal, maybe because a frittata, too, becomes an easy breakfast for another day or two. Maybe it’s because you can put nearly anything into a frittata, so you get a lot of mileage out of this one recipe. Whatever the reason, I’ve probably made more frittatas than any other recipe I have. You need one thing: eggs. Everything else is optional. Potatoes are traditional, but not mandatory. I’ve never made a frittata without some kind of cheese, but even that’s not necessary. Onions, scallions, summer squash, asparagus, spinach, peas… all excellent veggie options. Bacon (duh), sausage, steak, chicken, salmon… all terrific meat options. Potato, asparagus and gruyere? Don’t mind if I do. Hangar steak, caramelized onions and farmhouse cheddar? Why, thank you Marcey Brownstein Catering. Salmon, Parmesan cheese, cream cheese and scallions? Bring it on! 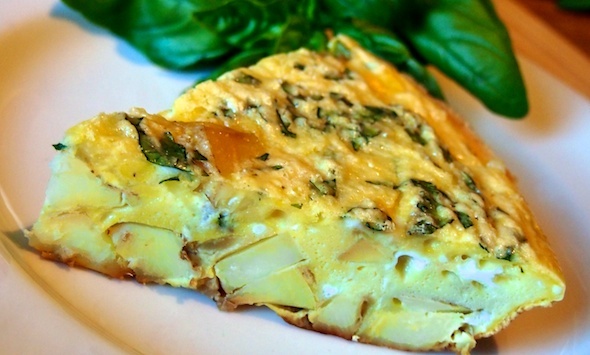 Here is a recipe for your basic frittata with creamy potatoes, gruyere cheese and caramelized onions. And here’s a list of the recipes right here on My Tiny Kitchen that make GREAT leftover frittatas. Rosemary Garlic Sides Trio – this is a frittata in a box! Use either of the potato dishes plus the Zucchini & Red Onions with the cheese of your choice for an ovo-lactose vegetarian (is anyone an ovo-lacto vegetarian anymore?) option. 1 1/2 cup shredded Gruyere cheese— Or try a good cheddar, manchego, Gouda, Jack. You can even mix them. In an oven-safe 10 inch skillet, heat the olive oil over medium-low heat. Add the onion, a pinch of baking soda (about ⅛ tsp) and season with salt and freshly ground black pepper. Sauté, stirring often, until the onions turn translucent and then start to caramelize, about 5 minutes. NOTE: That pinch of baking soda may be tiny, but it is mighty! Baking soda creates a more alkaline environment in the pan which helps move the caramelization along. Without it, this step would take 7-10 minutes. But it really takes a little less than 1/8 tsp, or just a pinch for this amount of onions – any more leaves a metallic tinge to the party. While the onions do their thing, you can multi-task with the eggs (crack a few eggs, stir the onions, crack a few more eggs…): in a mixing bowl, whisk together (use a fork for this, trust me-it does this job better than a whisk) the eggs, ½ tsp kosher salt, ¼ tsp garlic powder and ¼ tsp freshly ground black pepper. Once well whisked, stir in the parmesan and Gruyere cheeses and the basil. When the onions begin to caramelize, add the potatoes and stir briefly to mix and distribute the onions and potatoes evenly over the bottom of the pan. Slowly pour pour the egg mixture over the onions and potatoes, and cook for 1-2 minutes on top of the stove to allow it to set, then transfer the skillet to the oven. Bake for 25 minutes, or until the top is completely set and doesn’t jiggle when you shake the pad slightly. NOTE: the handle is HOT (duh) so use mitts. The easiest burn to get in the kitchen is from a skillet that’s been in the oven. We’re used to handling that bare handle, and habit trumps common sense every time. Do yourself a favor and get in the habit of putting a towel or oven mitt over the hot handle as soon as you take it out of the oven. It’s saved me from a seared palm countless times! Let cool in pan for 5 minutes. To remove the frittata intact, run a spatula around the edges and under the corner of the frittata, then use oven mitts to grip the pan with one hand and the handle with the other and shake it back and forth until the frittata loosens and begins to slide around a little. If you have a problem spot, use the spatula to loosen it. Then you will be able to simply slide the whole thing onto a cutting board. Cut into wedges and serve with a nice salad and toast, biscuits, croissants, English muffins or whatever breakfast bread you like. Use this recipe as a base for any combination of ingredients you like. Use fresh chives or dried oregano instead of basil. Toss in last night’s roasted asparagus. Thaw frozen peas under some running water for a minute, drain and toss those in. And don’t even get me started on meats – last night’s steak or salmon make an amazing frittata. And of course, the humble pig, in the form of bacon, ham or sausage, is always a welcome addition. Just chop and add to the pan with the potatoes. Go wild. There are no rules! Yayy frittatas! I’ve been making them in muffin pans for my panda’s breakfast on-the-go. These things are genius. Nice to see a post about them! Yum! Well, these are a great reason to flip those babies back over! Kellie, check out the rest of his blog; he’s got some brilliant recipes.